This morning, head over to Alice Merlino’s blog, Futuregirl, for a great review of Crochet Adorned (I’m so flattered!). Alice talks about her favorite projects in the book, and then shows you the results of what she’s already been dreaming up from the swatches and projects in the book. We’re still in Portland, getting ready to drive back to Bozeman today. We’re thinking it’ll be a slow drive, since, let’s face it, we’ve been enjoying our time away from our real lives. We had so much fun hopping around Portland and hanging out with Susan and her family. 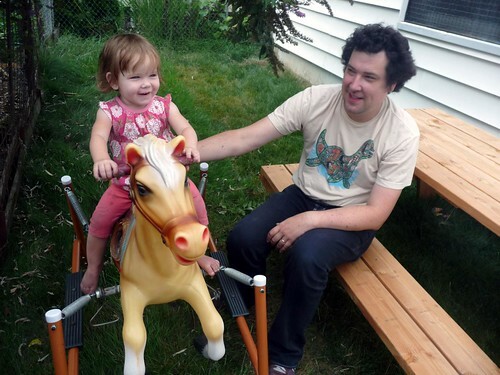 Here’s a pic of the adorable Pearl and Andrew at a BBQ they had for us. 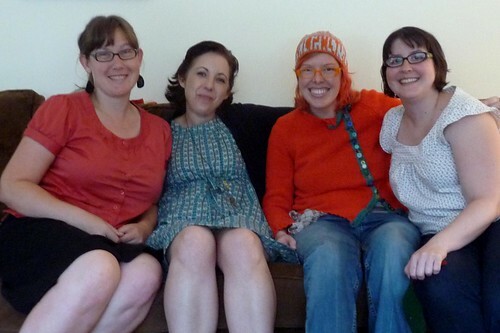 And here’s another favorite photo of Susan, Diane, Lee and I after hanging out for a crafty/shopping day. I’ve had an unspoken rule that I won’t buy any fabric because I haven’t been sewing at all lately (too much work to do! ), but I lifted it for Portland. There were so many great fabrics to look at and I gave in at Bolt and Cool Cottons (my favorite fabric store yet!! )- I’ll have to show you some of them when I get back. Check out my flickr page for the complete photo set. We’ll be on the road after this (if anything exciting happens, I’ll tweet), but the scheduled post for tomorrow is at Craftstylish, so be sure to check it out. Susan will probably do a round-up of my events, too. We’ve simply been having too much fun for scheduled blogging! Miss you guys already! Come back soon!! Hi Linda! I bought your book yesterday through a local bookshop, similar to Amazon. Now I just have to wait 2 weeks for it! Love all the projects I have seen on reviews so far and acnnot wait to try my hand at many of them! Hope you enjoy the rest of your trip! I'm glad you had a good time in Portland! I really wanted to make it up there but some deadlines got in the way. I did see your segment on AM NW though!